This article is published in "The Louisiana Weekly" in the April 14, 2014 edition. Oil refiners can learn from Europe as they try to reduce accidents at plants in Louisiana and other states, U.S. safety experts say. After a string of disasters, President Obama issued an executive order last August to improve chemical facility safety. A year before his directive, a fire at Chevron Corp.'s refinery in Richmond, Ca. filled the air with black smoke and particles, sending 15,000 residents in search of medical attention. An April 2010 explosion at Tesoro's refinery in Anacortes, Wa. killed seven workers. "Refineries all over the United States are dangerous," United Steelworkers Local 13-12 spokesman Bob Landry said last week. He worked at ExxonMobil's chemical plant in Baton Rouge for 36 years before retiring in 2008. The plant uses feedstock from the company's oil refinery there. Landry, a former president of Local 13-12, said large European refineries that he visited have better safety records than their Louisiana counterparts. What makes Europe safer? For one thing, the EU adopted the Seveso directive in 1982 after a 1976 chemical plant explosion in Seveso, Italy. Under it, EU states must see that refineries and other companies using or producing chemicals have policies in place to prevent accidents. That approach is proactive, with safety viewed as a precondition to operating. In 1996, the first directive was replaced and broadened by Seveso II, and Seveso III becomes effective next year. Late last year, the U.S. Chemical Safety Board, a federal agency, recommended that California move to a performance-based regime for refineries similar to the "safety case" system adopted in the United Kingdom, Norway and Australia. The board's suggestion followed its probe of Chevron's Richmond refinery fire in August 2012. "Safety case is all about regulatory relationships," John Mendeloff, director of the Center for Health and Safety in the Workplace at the nonprofit RAND Corporation, said last week. Under it, a refinery must explain to regulators what steps it will take to ensure safety. Regulators judge the plan, and if it's acceptable, they monitor whether the company is doing what it proposed. "This differs from regulators looking for hazards since that job is mostly left to the company," Mendeloff said. U.S. regulators and refineries have adopted some aspects of the safety case approach and should incorporate more of it. At a U.S. Senate Environment and Public Works Committee hearing on chemical facilities on March 6, U.S. Chemical Safety Board chairperson Rafael Moure-Eraso said U.S. refineries should try to reduce risks from chemical processes as much as is reasonably possible. That's the cornerstone of the European regulatory system, where according to insurance statistics, plants have fewer accidents than in the U.S., he said. Reinsurer Swiss Re found that financial losses at U.S. refineries were three times higher than in Europe though its figures are a bit dated now. When asked about that last week, Swiss Re spokeswoman Brigitte Meier in Zurich said the numbers were collected in 2005 for a specific case and the report is no longer available. In Louisaina and across the nation, the states and feds regulate refineries. Louisiana's 19 refineries are mostly along the lower Missisisppi River and around Lake Charles. Bad smells are common, and what's worse, serious accidents occur. ExxonMobil's Baton Rouge refinery had 65 releases and spills in 2012 and 2013 combined, according to Louisiana Dept. of Environmental Quality spokeswoman Jean Kelly last week. With crude oil capacity at 502,500 barrels a day, the Baton Rouge refinery is the nation's third largest. Outside New Orleans in St. Bernard Parish, ExxonMobil's Chalmette refinery is smaller but had 70 spills and releases in the last two years, Kelly said. Chalmette Refining, LLC, a joint venture with state oil company Petroleos de Venezuela, S.A , processes 195,000 barrels of crude daily. DEQ's release and spill numbers are lower than those of environmental groups, like the Louisiana Bucket Brigade in New Orleans, because of different reporting standards and the agency's science-driven data process, Kelly said. ExxonMobil's two Louisiana refineries pose serious threats to neighboring communities, according to the Bucket Brigade. The company, however, says emissions have declined at both sites and safety has improved. Since 1990, ExxonMobil's Baton Rouge refinery has cut volatile organic compound emissions by 68 percent, sulfur dioxide discharges by 46 percent and nitrogen oxides by 35 percent, spokeswoman Lana Venable said last week. And she said last year was the refinery's best ever in three key areas--environmental compliance incidents or ECIs, spills and flaring. Since 2006, the Chalmette site has reduced sulfur dioxide emissions by 90 percent, nitrogen oxides by 54 percent and volatile organic compounds by 69 percent, according to Elizabeth Ellison-Frost, spokeswoman for Chalmette Refining, LLC. Since 2010, Chalmette's carbon dioxide discharges have declined by 40 percent and particulate matter releases by 43 percent. Light hydrocarbon releases are zero for the fourth straight year, she said. The refinery recycles and recovers waste whenever possible. "In 2013, we had our best safety performance ever--466 days without an employee recordable injury," she said. The Baton Rouge and Chalmette refineries say they immediately report spills and excessive releases to regulators. But according to the Louisiana Bucket Brigade, refinery accidents statewide are greater than what the state and companies say because of self-reporting biases at the plants; estimating rather than measuring the amount of pollution released; and incomplete written reports. One of the tools LABB uses to track accidents and community impacts is its iWitness Pollution Map, showing citizen accounts in real-time, along with National Response Center reports. Landry said top refinery owners, including ExxonMobil, BP, Chevron and Shell, own plants in the United States, Europe and elsewhere--sometimes in partnership with other companies. But they run them differently depending on the governments, business climates and cultures in each nation. Several European countries with large refineries, including the Netherlands and Belgium, are social democracies, he said. "Refining companies there do far less lobbying of government officials than in Louisiana," he said. "Unions are accepted, whereas in the U.S. they've fallen out of favor." And many European refineries have councils elected from among their employees. Workers have input in keeping operations safe, and the safety culture is more pronounced, he said. ExxonMobil says its employees in Baton Rouge and Chalmette are closely engaged in safety. Baton Rouge's safety culture is built on extensive employee involvement and includes more than 20 safety teams, Lana Venable said. "Departmental safety committees have their own budgets and steward safety projects in their areas," she said. "And as part of our Loss Prevention System, we abide by 'do not proceed unless everything is safe.' Prior to any task, all risks are assessed, analyzed and then acted upon to ensure safe operations." At Chalmette Refining, "we have a culture that any job can and will be stopped by anyone if there is a safety concern," Ellison-Frost said. "The job is only restarted once the issue is worked to everyone's satisfaction." From what Landry has seen, however, refiners in the United States jeopardize safety because they're intent on holding down costs. "In the U.S., the refinery owner, the government and the employees pay lip service to safety," he said. "Then when an incident occurs, they're pointing fingers at one other." An employee speaking up about a hazard might go unheeded. And a move in recent years to hire contract workers at Baton Rouge and other U.S. refineries has affected safety. He said hourly, non-professional employees tend to focus on their own pocketbooks and job perks and don't necessarily care about safety. At 2012's end, ExxonMobil's Baton Rouge refinery had 1,295 employees and 1,200 contract staff, Venable said. U.S. refiners rely too heavily on temporary fixes, like clamps on leaks in lines, particularly if the leak is considered low risk and they don't want to shut down an operation. "You'll see 15 or more clamps on a line," Landry said. And U.S. refineries use run-to-failure or RTF maintenance, allowing equipment to operate until it breaks--at which point spare parts might be ordered. "Under RTF, they don't keep spare parts because inventory takes up room and you need people to guard it," he said. "Instead, they order them for next day delivery." Mechanics get frustrated and work is delayed when parts aren't on hand. So how does Louisiana regulate its refineries? Agencies impose limits on emissions and rely on testing, monitoring, record keeping and reporting to regulate plants, DEQ's Kelly said. Refineries must have federal Title V permits under the Clean Air Act to limit emissions. They have to submit annual compliance certifications detailing that air pollution requirements in their Title V permits have been met. Under federal and state regulations, refineries are required to have Risk Management Plans to prevent accidents. They need permits for solid waste, waste water, hazardous waste and storm water run-off. For managing hazardous waste, each facility must do a waste analysis, train personnel, maintain security and have financial assurances for closure and liability. 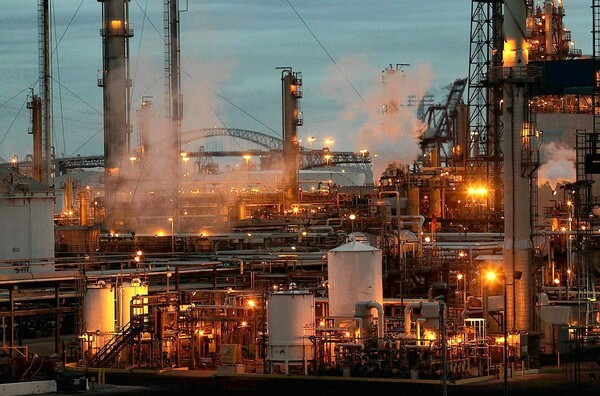 Louisiana's refineries are required to have emergency response provisions and contingency plans for protecting employees and the public from accidents, Kelly said. Under state law, they must have a spill prevention plan on site for inspectors to review. While these rules may be enforced by the state and feds, in Louisiana ExxonMobil typically pays little in fines for its violations, environmental groups say. The Baton Rouge refinery, for instance, was able to settle many of its recent violations by promising to do community work. Landry of USW said refiners operating in the United States could benefit from the strong corporate, union and government relationships seen in Europe. But he questions whether those liaisons can be forged anytime soon, given the business climate here. The Louisiana Bucket Brigade says anyone one seeing, smelling or hearing pollution, can call, text or email that information, along with photos, to the iWitness Pollution Map. You can also sign up for pollution alerts. To learn more, visit here.